Everyone knows that names that start with “Mc” are Irish and names that start with “Mac” are Scottish, right” Well . . . no. All “Mc” and “Mac” names are of Gaelic origin and are patronymics, which means that they are derived from the father”s name. “Mac” means “son of”, as in MacGannon means “son of Gannon” and MacDonald means “son of Donald”. The original form of “son of” was “Mac”, but it was often abbreviated as “Mc” (with or without a line or two dots under the “c” to show that the “a” was removed), or as “Ma”. And to make it even more confusing, “Mac” was sometimes abbreviated to a simple “M” “, rather like the Irish “O”, meaning “of the line of” (e.g. ” O”Neill means “of the line of Neill). The Scots were not the only Celtic tribe to settle in Scotland, and there was much intermarrying among these tribes. They also intermarried with the local people, including the Picts, who, of course, had their own language. As a result, Gaelic in Ireland and in Scotland diverged, becoming two related, but distinct languages. So now we have “Mac” and “Mc” on both sides of the North Channel, right” Right (whew). And we know that Scottish names can be spelled “Mc” and Irish “Mac”, right” Right again. OK, . 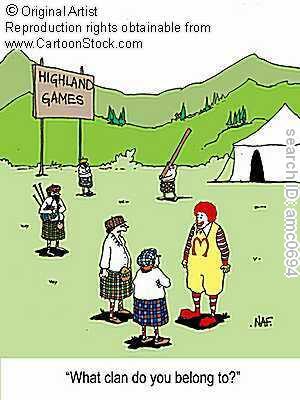 . . and we know that all Scottish “Mac” and “Mc” names are originally Highland names, right” Well . . . no. Some Highlanders dropped the “Mac” prefix for political or economic reasons after the collapse of the Jacobite movement or during the Highland Clearances, or later, simply to be fashionable. And, just to make it even more confusing, some Lowland Scots (and English) actually added “Mac” prefixes to their names when being a Highlander was all the rage (after King George IV”s visit to Scotland in 1822 started a trend that roared through Britain). OK, but at least we know that all the Irish “Mac” and “Mc” names are Irish, right” Well . . . no. There were several waves, starting in medieval times, of mercenaries from Galloway and other Scottish districts lending their sword arms to help Irish leaders. The Scottish men intermarried with the locals and their inherited names are called Gallowglass. McCabe is an example of a Gallowglass name; there are hundreds of others. And then there”s the “plantation” of Ulster, also centuries long, during which Scottish families, both Lowland and Highland, moved to Northern Ireland. What about those “Ma” names, like Maguire and Malone” Maguire is the same name as McGuire or MacGuire, which originally, in Gaelic, was MacUidhir. The “g” was added when the name was Anglicized. So that would mean Malone was originally MacLone or some variant, right” Well . . . no. Malone is an example of a name from which the “O” was dropped; it was O Maoileoin, or something similar, and might have been spelled a number of ways. How does one know” A hint – spelling isn”t everything. “Mac”, “Mc” and “Ma” names are spelled in a variety of ways ” some quite creative. Today most people can spell their own names, but that was not always the case. Changing education levels ” and fashion ” were also factors, not to mention the alterations to names caused by spelling or reading errors through the centuries. Spelling was sometimes changed as immigrants came through Ellis Island or other immigration stations, often by people who had never heard names like these before. Confused yet” We haven”t even started to talk about the controversy over capitalization. Purists tell us that only the son of a Donald can be called “MacDonald”, that everyone else of that name should be Macdonald, with an uncapitalized “d”. Try telling that to a proud MacDonald. At least we know for certain that all “Mac” and “Mc” names are either Irish or Scottish, right” Well . . .no. In Wales there are the “Map” names, from the Celtic “P” language; these names have often been Anglicized into “Mac” and “Mc” names, but the bloodlines are Welsh. And then there”s the Galatian and Breton Celts . . . But that will all keep for another time.